The softball season is just getting started, but teams across the country are already making headlines with big upset wins, crazy stats and exciting finishes. Three of the top-10 teams fell to unranked opponents on Sunday night, and here’s everything you need to know about the action. 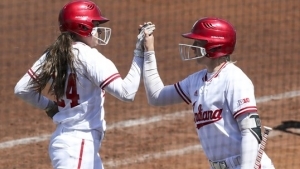 The Hoosiers delivered Georgia its first loss on Sunday night, prevailing over the Bulldogs 6-4 behind runs from Taylor Lambert, Grayson Radcliffe, Makayla Ferrari, Paige Chitwood and Karly Combs. Georgia raced out to an early lead against the Hoosiers with two third-inning runs, but Indiana couldn’t be stopped. Head coach Shonda Stanton’s team launched a comeback effort with three runs in the fourth inning and another run in fifth. The Bulldogs fought back, securing a run in the sixth and nearly notching another but the score remained 4-3 with one inning to go. Indiana’s Radcliffe came to the plate in the final inning on a mission, and her hit to right field brought her around the bases and brought in Lambert with her. The runs gave her team two insurance runs, a critical moment in the final stretch. Georgia needed three runs in their final at-bat, and at first, Mahlena O’Neal showed that such a task could potentially be achieved. The junior sent the ball flying into the back of left centerfield to score, but Georgia couldn’t follow up with any more runs and ultimately suffered the loss. The Bulldogs moved to 4-1 with the loss, while Indiana stays undefeated at 5-0. In the final match of the USF Opening Weekend Invitational, the Wildcats failed to fend off the persistent Wolfpack, dropping to unranked N.C. State 4-1. The Wildcats took the early lead in the contest off a home run from Alyssa Palomino-Cardoza in the first inning, but her homer would prove to be the final point for Arizona. The Wolfpack took over in the second inning with a home run from Angie Rizzi, the first of her career, and they put up three more before the end of the afternoon. Brigette Nordberg gave N.C. State the one-run advantage with leadoff homer to right field, and Logan Morris put the Pack ahead by two with her homer. Rizzi then hit another single before pinch runner Chandley Garner put the last point on the board to bring the score to 4-1. The win marks the first time N.C. State has beaten a top-10 ranked opponent since April 2015. Despite the momentum from their top-10 win, the Wolfpack dropped their final game of the weekend to No. 5 Florida 2-1 to bring their season record to 3-2. Arizona suffered a loss to the Gators 3-2 earlier in the weekend as well. In a battle of the Carolinas, the Gamecocks dropped 4-0 to North Carolina after a fifth-inning surge from the Tar Heels. North Carolina took the early lead off a sac-fly from Kiani Ramsey in the first inning to put the Heels on the board, and they never let the lead slip, refusing to give up a single run against the Gamecocks. The score remained 1-0 for the first four innings until the North Carolina team of Destiny DeBerry, Kiersten Lincea, Shayla Thompson and Hannah George took over. DeBerry’s bunt took her to first, and then second, after a miscue by South Carolina, and Lincea also ended up on base after a walk. Thompson came in for Lincea to run, and George followed with the perfect hit to set them all up for success. With two runners on base, George fired a home run to right center to send her and her teammates across home plate for three runs. The scoring sequence would be the last of the game for either team but was enough to give UNC the upset win and send South Carolina home with the loss. Outside of the Top 10, No. 13 Kentucky and No. 24 Mississippi State also lost to Oklahoma State and Stephen F. Austin respectively to round out the night of unexpected wins and losses.